A lot of words have been used to describe the Tricky Martian Trio over the years. Everything from Turntable Hop, to Jazz Hop, to Needlists, and Sound Art, ect.and so on. They claim it all, and throw in their own term "Jugglin". 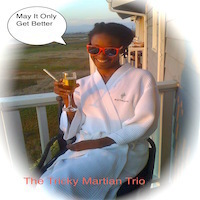 But the answer is invariably the same, They are pure Tricky Martian Trio. Tricky's " Ill Magnifico "
Hi guys, I am a dutch music producer living in BG and I am being trained into the fine arts of scratching and I just want to tell you that YOU ROCK! Loved it!